When you have people saying these people are lone wolves, they always say these people are unhinged, and the third thing they always say – ‘we didn’t know about it’ – what? The whole family, every friend of a certain group didn’t know about this? Dr. Paul Spoonley, sociologist, who wrote a thesis decades ago on the ‘extreme Right’ in New Zealand, published as book called the Politics of Nostalgia, is trotted out as the media’s academic-in-waiting for any commentary on ‘racism’ that requires a scholarly façade, however banal and outdated. As is his wont, over the past decades, Dr. Spoonley insists that the threat of ‘white supremacy is dire and ever-present. He was even able to cite three examples of skinhead murders over the course of decades, albeit one based on homophobia rather than racism. Does this mean that race-based gangs such as the Mongrel Mob, Black Power and Killer Bees can be described as having committed multiple acts of ‘hate crime’ in their long histories of violence? Spoonley alluded to the ‘extreme Right’ in New Zealand having around several hundred followers, but did not name a single group. The other major factor in this is the demand that social media censor ‘racist’ material. As is well known by anyone at least halfway informed on such matters, the corporate elite that runs social media has been draconian in its censorship of any dissident material, and one does not have to say much at all on Facebook, for example, to be banned or suspended. My book Zionism, Islam, and The West, having just been translated into Arabic by Algerian scholar Dr. Mahmoud Braham, was banned without explanation by Amazon, along with two books on banking, also published by Black House Publishing, by a former director of the South African Reserve Bank, Stephen Goodson. But for liberalism no suppression can go far enough in eliminating dissent, and in this case it is said that Facebook did not act fast enough in suppressing the film footage of the gunman. New Zealand’ chief censor has ruled that to even have a copy of the film footage is a criminal offence. As it is, the only two ‘Right-wing’ groups in New Zealand that defended White interests, have promptly shut down. 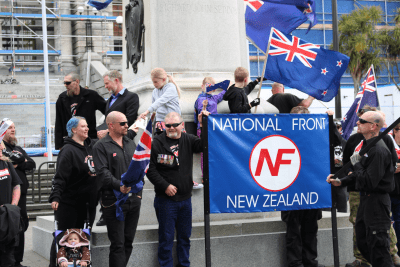 The New Zealand National Front existed primarily as an anti-migration webpage, bereft of policy, ideology, organisation, or strategy. The leadership was intelligent and articulate, but the feedback that was permitted onto the page was of the most inane type, and the obsession was with migrant crime. Frankly it is no loss. What is a loss is that The Dominion Movement self-obliterated the very day of the Mosque shootings with the final comment on their website that the atmosphere this would generate would make their work impossible to continue. Ironically, just a few weeks before, they had celebrated their first anniversary, bringing together 50 delegates from around New Zealand, and as a guest at their social event I was able to confirm my previous impressions: that every single one of these folk of the younger generation were articulate, intelligent, well-informed and responsible. Their nefarious activities had included tramping, boxing, camping, cleaning beaches, and scrubbing out graffiti. The articles on their website had comprised exceptionally well-researched material on New Zealand history. The quality of membership and the depth of thought had not been seen in New Zealand for decades. It was New Zealand’s branch of the Identitarian movement. That is an irreparable loss, but it is not certain that their closure will be permanent. What remains on the supposed ‘Right’ in New Zealand are websites which have been critical of Islam, while upholding Israel as the ideal of what a nationalist state should be, and defining their version of ‘Right’ as capitalism and libertarianism. We have seen the same among so-called parties of the ‘Right’ such as that of Geert Wilders in The Netherlands, whose party combines Classical Liberalism with pro-Zionism , and the antics of the Zionist-funded Tommy Robinson, who is getting a fan base in New Zealand. Islamic State Watch – New Zealand, remains intact and unmentioned amidst the mass hysteria, and has a relatively significant following of over 1,700. There also remains Right Minds – NZ, libertarian and pro-Israel. This is not Alt-Right. Politically – By organizing and funding the 25,000-person ‘Free Tommy’ London rally on June 9 and now the July 14 protest, also taking place in London. Why are the New Zealand Muslim clergy and other Muslim spokespersons in New Zealand mute on the actual perpetrators of Islamophobia, and why have they invented a bogus ‘white supremacist threat’ to the world? Among Daniel Pipes’ credentials, he has taught at the ‘U.S. Naval War College; currently he is an affiliate professor at the University of Haifa. He served in five U.S. administrations, received two presidential appointments, and testified before many congressional committees’. MEF aims to defend U.S. interests and the values of Western Civilisation in the Middle East. Hence it aims to see the subordination of the region to outside interests. This is not a Right-wing goal; it is the doctrine of American liberal-internationalism of the Woodrow Wilson type, and the MEF/neocon perception of ‘Western Civilisation’ is that of Late Western liberal doctrine, which we are told by neocon ideologues, will result in the ‘end of history’ once its global hegemony is achieved. It is nonsense to see anything ‘right-wing’ in this. The event generated mass hysteria that shows no signs of dissipating, and it has been politicised not only by the liberals and communists but by the Muslim leadership. What struck me immediately in regard to the hypocrisy, was that Muslims had been undergoing atrocities on a regular basis for over seventy years, first at the hands of the Israelis, and later joined by the USA and others. How active were the mass of hand-wringing New Zealanders, and especially the politicians, in ever condemning this? Now the slogan suddenly becomes ‘we are one’, ‘they are us’, and that we are all united in love; ‘aroha’ (Maori). The New Zealand Jewish Council is committed to consulting and working with the Muslim community to ascertain their immediate and longer-term needs and how we can assist. We have begun that dialogue, but in the fullness of time we will have a better understanding of where we can best channel our funds. A cynical interpretation could view this as buying one off. It is interesting how ‘liberal’ such organisations of Diaspora Jewry can be when dealing with migrant issues in all states – other than Israel. For example Israel voted against ratifying the U.N. Global Compact on Migration, Prime Minister Netanyahu stating: ‘We have a duty to protect our borders against illegal infiltrators. That’s what we’ve done, and that’s what we will continue to do’. 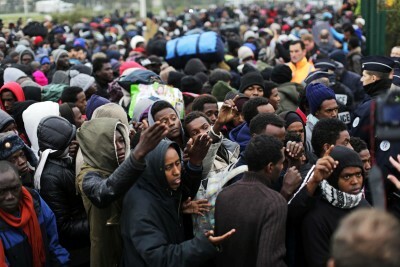 Furthermore, there is presently a move to expel African ‘refugees’ coming into Israel, the Israeli state rejecting their claims to ‘refugee’ status. …The Africans, mainly from war-torn Sudan and dictatorial Eritrea, began arriving in Israel in 2005, through its porous border with Egypt, after Egyptian forces violently quashed a refugee demonstration in Cairo and word spread of safety and job opportunities in Israel. Tens of thousands crossed the desert border, often after enduring dangerous journeys, before Israel completed a barrier in 2012 that stopped the influx. While the migrants say they are refugees fleeing conflict or persecution, Israel views them as job-seekers who threaten the Jewish character of the state. While opponents of the U.N. Compact and related matters are described routinely as ‘right-wing nutjobs’, Netanyahu seems to have been overlooked in applying such a description. As indicated by the Herald article, the event has been manipulated as part of an anti-White agenda. Why were Maori given a special place to declaim against ‘Pakeha’ New Zealanders, with their skewered interpretation of historical events such as Parihaka? It has become an anti-White frenzy, and befuddled liberal Whites roll over and take it with masochistic delight. One might have thought that the subject of Zionist colonialism in Palestine, or U.S. neocon colonialism in Afghanistan, Syria, and Iraq would have been more relevant than a regurgitation of Maori grievances. The Mongrel Mob gang acted as security at several events. ‘This has given confidence to fascist elements here and overseas, culminating in last week’s tragic and harrowing outcome. Deputy Prime Minister Winston Peters is himself guilty of perpetuating the myth that mosques conceal a fundamentalist underbelly which poses a threat to Aotearoa. We utterly reject and condemn this anti-Muslim rhetoric’. Even today we can still observe in the East the rule of Islam, of the old prejudices, beliefs and customs but these will more and more turn to dust and ashes. Just as a rotting piece of cloth, when you look at it from a distance, it seems to be all of a piece, all the pattern is there and all the folds remain but a movement of the hand or a puff of wind is enough for the whole cloth to turn to dust. And so in the East the old beliefs which appear to be so deep are actually but a shadow of the past. Frankly I am most alarmed. I don’t want to sound alarmed but I am. I feel like some Russian civilian in 1920. All I see and hear is a loud, overwhelming Left Wing ‘Analysis and Conclusion’ that aims to push some weird Utopia, perhaps the Crystal Palace that Dostoyevsky warned us about. Does nobody else see and hear the Marxist thought, the Neo-Marxism and Post-Modernism? Apparently not. You are right. There is an element of posturing by parties and factions, and I ask myself ‘where is this leading?’ Precisely, where is this leading? I suspect there will be a concerted effort to restrict Free Speech and have some Committee of Virtue decide what we should all see and hear in future. This is not good. I worry. The suppression of genuine dissent is a major part of the agenda of the present Muslim leadership, along with their liberal, Communist, Zionist and other allies. 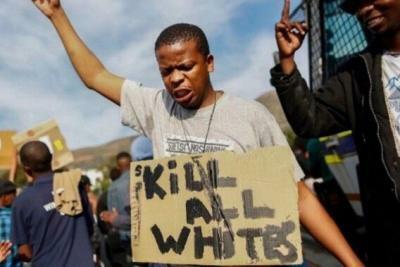 They have been pushing for ‘hate laws’ for several decades, that will, like the present race relations and human rights legislation, be aimed specifically at White dissidents. The mythic ‘white supremacist’ bogeyman has to be maintained. The Herald article states that, ‘Other groups associated with the rally included Unite Union, Socialist Aotearoa, Auckland Unitarians, Migrant Workers Association of Aotearoa, NZ Palestine Solidarity Network and Organise Aotearoa’.Unite Union is Trotskyite influenced, Organise Aotearoa is a Communist outfit that does not define its faction. Love Aotearoa, Hate Racism sells merchandise that features the ‘gay’ rainbow colours depicting clenched fists and the words ‘Socialist LGBT’, rainbow flag tee-shirts proclaiming ‘ pride, not police’; a rainbow coloured ‘pride’ clenched fist. Ibrar Sheikh of the Federation of Islamic Associations of NZ was on the rally platform with Comrade Carolan, and presumably surrounded by rainbow fist symbolism. What type of Islam is this? The news media reported on the Auckland rally, yet there was no comment on the leadership by ‘Left-wing extremists’. Do New Zealand Muslims, in aligning with their Communist associates, support feminism, abortion liberalisation, and homosexuality; conversely do these Communists support those beliefs in Islam which would in any context among Whites be condemned as ‘fascist’? Again, it is the politics of cant, and manipulation. Zainab Mussa attended the vigil with her two young children but they left early partly because of the ‘uncomfortable tone’. ‘Even being non Pākehā, I did feel uncomfortable at times with the continued mentions of white extremism and white terrorism.’ While she said she understood the need for a conversation about racism and white supremacy, she felt a week after the attacks was too soon. ‘I think there was too much mention of “white” and colonial times. To me that wasn’t a remembrance of the victims and not the way to push for unity’. The event has been used to define the ‘Alt-Right’ as ‘white supremacy’, neo-Nazism and the usual gamut of smears. This is perhaps best represented by journalist Philip Matthews. He mixes the libertarian Canadians Molyneux and Southern (‘alt-right provocateurs’); Norwegian gunman Anders Breivik; pro-Zionist Right Minds – NZ; the libertarian ACT Party (founded mainly by renegade Labour Party stalwarts) the New Conservative Party, Hungary’s Viktor Orban; Greece’s Golden Dawn, Donald Trump; Australia’s One Nation Party; Daily Stormer; American gunman Dylan Roof; and ‘Unite the Right’ at Charlottesville’, into one worldwide poisonous brew. Matthews could not define the ‘Right’, and hence the ideological muddle of the examples given; the one sufficient denominator apparently being scepticism over immigration reaching critical mass. If such ideological and historical conflation is legitimate then might we regard the Labour Party as directly associated with Bolshevism, Mao, and Pol Pot, or the obsessive liberal dogma that pervades New Zealand as the legacy of the Jacobin Terror? What is more disturbing, indeed disappointing, is the reaction of the leadership of the Muslims in New Zealand. This was perhaps first noticeable in 2004 when the Islamic Federation jumped aboard an ad hoc organisation called Multicultural Aotearoa, founded by anarchists and Trotskyites, to stop a ‘defend the New Zealand flag’ rally being held by the NZ National Front. Among the notables at the founding-meeting was David Zwartz of the NZ Jewish Council, joining up with Muslims (who had never been critiqued by the NZNF at that stage) and members of the Wellington Palestine committee. Perhaps there had been a shift in the leadership of NZ Muslims since around 2004. Certainly, the response of the Muslim leadership now is to jump on a liberal bandwagon and regurgitate the hypocrisy of Western liberalism from which Islam has been largely immune. Actual Islamophobia has not come from the Right, with its historical sympathy for Palestine, and Arabs, betrayed for the past 100 years, since the Sykes-Picot Agreement and Balfour Declaration, but by those organisations that the news media and Left dishonestly call ‘Right’. This bogus ‘Right’ condemns Islam precisely because the religion runs counter to Late Western Classical Liberalism. Hence, certain ‘gays’ for example, have become prominent in such parties, because of ‘homophobia’ in Muslim communities. Hence the involvement of Pym Fortuyn in The Netherlands, and presently Ann Marie Waters of the For Britain movement. ‘For Britain believes in a free market and capitalist economy’ as one of the founding principles. That and other such parties called ‘Right’ by journalists, academics, and other idiots, base their opposition to Islam on issues with which Islam and the actual Right would find agreement. The imams in New Zealand are preaching ‘love’ and ‘peace’ and brotherhood. It would be superfluous to mention the religious conflicts among Muslims, such as between Sunni and Shia. Perhaps we have been spared that in New Zealand because most are Sunni? When liberalism seeks an alliance with Islam in the name of multiculturalism things become problematic. To what extent is homophobia existent within Muslim communities? This month Muslims in Birmingham took their children out of a Birmingham primary school and protested outside the school against the intention of the assistant head teacher to teach children about homosexuality and transgenderism, with books entitled Mommy, Mama and Me, and King & King. 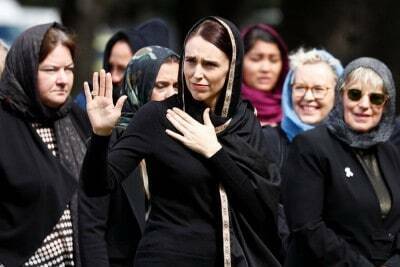 It was going to be done under the slogan ‘No Outsiders’, which seems to be just as banal as the slogans adopted in New Zealand by Muslim leaders and their new found liberal friends. Slogans by the Muslim parents included: ‘My children, my right’; ‘Exploiting children’s innocence’; ‘Let kids be kids’; ‘My child, my choice’. It all seems a tad exclusionary; not really ‘we are one’; somewhat Alt-Right. Neither is there any need to enter into a prolonged discussion about women and Islam. Feminist issues have long been used by liberals against Islam. Even the attractive hijab headscarf is regarded as repressive by Western and Muslim feminists and liberals. When the zombified packed into Hagley Park, Christchurch on 22 March to observe the mourning for the Mosque victims, were there any looks of askance by the mass of liberals at the segregation of male and female audiences? This is not intended as a sleight at Islam, but to question the sincerity of those exploiting the deaths with slogans about equality and onehood. 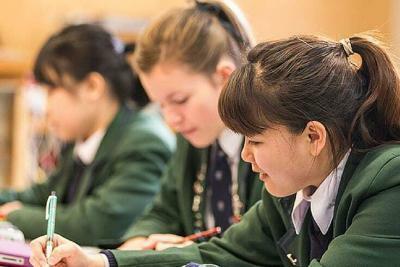 As mainstream Muslim women, we see the girl’s headscarf not as a signal of “choice,” but as a symbol of a dangerous purity culture, obsessed with honor and virginity, that has divided Muslim communities in our own civil war, or fitna, since the Saudi and Iranian regimes promulgated puritanical interpretations of Sunni and Shia Islam, after the 1970s Saudi oil boom and the 1979 Iranian Revolution. Today, well-intentioned women are wearing headscarves in interfaith ‘solidarity.’ But, to us, they stand on the wrong side of a lethal war of ideas that sexually objectifies women as vessels for honor and temptation, absolving men of personal responsibility. … This purity culture covers, segregates, subordinates, silences, jails and kills women and girls around the world. A Kiwi teenager radicalised online planned to ram a car into a group of people in Christchurch and then stab them. The teenager wrote a goodbye note to his mother, then started a violent incident, but has since told a psychologist when it began he ‘decided not to hurt anybody because he did not have the means to kill enough people’, Crown prosecutor Chris Lange told the Christchurch District Court at sentencing on Thursday. 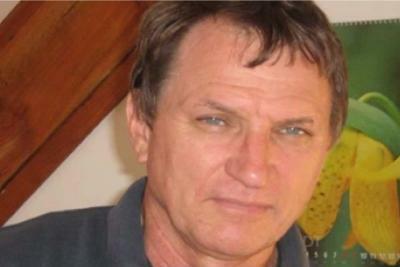 ‘The reason no-one was hurt was that he did not have access to knives,’ Lange said. But there was significant premeditation, and hostility towards non-Muslims. The youth’s name is suppressed and the details of the offending cannot be published. He has admitted eight charges. People were frightened by his actions during the incident last year, and damage was done, but no-one was hurt before he was held until the police arrived. Lange said even though the youth had been treated for months by the youth forensic psychiatric team, he was still seen as a high risk of reoffending, and a risk to family members and members of the public. … Pre-sentence reports indicated he had the potential to act more violently than what happened. I am not interested in countering Mr. Arafeh’s insistence that this is not genuine Islam. I merely wish to point out again the hypocrisy in the blanket condemnation of the Right, and the demonisation of anyone who dissents from the Establishment lines on immigration and multiculturalism. What makes this youth an aberration of Islam who needs helping, while Tarrant is supposedly a typical manifestation of the Alt-Right? Again, a double-standard. In 2016 the first person jailed in New Zealand for ‘circulating objectionable material related to extreme violence’, was sentenced for ‘distributing and possessing videos depicting cruel violence perpetuated by terrorist group Isis’. Why should Rightist be tarred with the same brush, any more than Muslims? What makes one stereotype any more legitimate than another? The terrorist tried to tear the nation apart with evil ideology. Instead we have shown that New Zealand is unbreakable. And that the world can see injustice an example of love and unity. … We are determined to love one another and to support each other. This evil ideology of white supremacy did not strike us first, yet it has struck us hardest. But the solidarity in New Zealand is extraordinary. … We call on governments around the world, including New Zealand’s and its neighbouring countries, to bring an end to hate speech and the politics of fear. … Last week’s events are proof and evidence to the entire world that terrorism has no colour, has no race and has no religion. The rise of white supremacy and right wing extremism is a great global threat to mankind and this must end now. Imam Fouda politicised his speech. He used it as a plug for ‘hate laws’ which, we are told by Muslim spokespersons (women have now become conspicuous), the Muslim community has long sought. Imam Fouda focuses on ‘white supremacy and right wing extremism’ in his talk, which was supposedly to mourn the dead, calling these ‘a great global threat to mankind’. With respect, what nonsense. How many ‘white supremacists’ and ‘extreme right –wingers’ control banks, newspapers, television networks, Hollywood, armies, states, or weapons of mass destruction? It is not ‘right wing extremists’ who invaded Muslim lands, bombing them into submission, causing the refugee crisis. What a betrayal of Muslims to come up with a red herring as lame as ‘white supremacists’ and ‘extreme right–wingers’ as ‘a great global threat to mankind’, apparently so that some Leftist agenda might be served. The Muslim community is a global community of diversity, variety and color. We are taught to accept every Muslim (and non-Muslim) with complete disregard to their color, nationality or ethnicity. Yet somehow black Muslims (and Muslims of color in general) experience racism from our brothers and sisters in Islam. Every attempt to tackle these issues has been swept underneath the rug with the phrase ‘One Ummah brother, we accept no racism in Islam’. How can you explain the feeling of superiority towards black and brown people? Why are we still finding excuses on anti-blackness in the Muslim community? When we are not willing to accept the problematics beforehand and try and solve these blatant issues proactively. I’m sure it is commonly known by now that an individual can be ostracized for what they believe in. As absurd as that sounds, yes, many Muslims are targeted due to their beliefs. But beliefs can change – skin color cannot. One would imagine, because we share this frightening reality, that Muslims would band together against outside hate, right? Unfortunately, the Muslim community has its own stomach-wrenching issue with racism, but even more than that, an issue of Arab supremacy. Liaden recognizes two important things worth noting to the reader: (1) There is a history of racism and colorism that can easily be found within Muslim communities around the world, and (2) That racism and colorism can easily be found in our present, meaning that after centuries worth of exclusion and discrimination, change has not been achieved. I would go so far as to claim that the Muslim community on the whole has not even put an effort forward to change, and in fact could potentially be accused of ignoring that the problem exists at all. Another Muslim woman alludes to the lack of ‘dark skinned Muslim women’, ‘whether Black or Asian, in the small Muslim fashion industry. ‘Forgive my silliness but I genuinely went through quite a few reasons in my head to justify the absence of dark-skinned Muslim women. … As a community and as an Ummah, we are still dealing with deeply entrenched issues of colourism and anti-blackness’. So far I haven’t mentioned a specific community within the ummah, because I genuinely think the issue of colourism, while more prevalent in some cultures and communities, spans across Muslim communities worldwide. These tensions have inevitably led to a proliferation of smaller Islamic centres in Auckland where more than 20 different groups currently operate outside the established, older Muslim institutions and indeed, outside the national Islamic Federation. As for the present, a well-placed Muslim has commented: ‘The factionalism is still rife if quiet. There will be one funeral in Auckland. He is a member of the Fiji Indian community and they want him buried in “their” Muslim burial plot’. The Right, hitherto in conflict with Zionism because of the inherent character of the doctrines, often now has not only an anti-Muslim position motivated by opposition to Third World immigration, but also combines this with a growing sympathy for Israel. It is said that politics makes strange bedfellows. Well, this situation is downright perverse. It seems that often the swarthy and even black faces of many Muslims and the fair complexions of many Israelis are sufficient for Rightists to define their positions on the Middle East, Islam and Zionism. Those on the Right who claim to stand for Western resurgence are not going to succeed by aligning themselves with the architects of the West’s cultural and social decay. Whoever browses the catalogues of nationalist bookstores, whoever reads nationalist newspapers and magazines, whoever visits Internet forums where young and not-so-young activists of the nationalist right express opinions will immediately notice that rabid anti-Islamism reigns. The cause would seem clear: Islam is the enemy of the French nation and of European civilization, and therefore of the nationalist movement. But beyond ‘the obvious,’ and beyond appearances, is it reality? An objective approach to the facts calls for a reply in the negative: Islam was not always looked upon negatively by nationalists, and at present, hostility toward it is not absolute in the ranks of committed rightists. They’re provoking French fears of what is commonly called ‘Islamism’ or ‘Moslem religious activism.’ The ones who provoke or manipulate these fears, not hesitating to grossly distort Islam’s message to make it better fit their conceptions, do it from a very precise standpoint: that of the globalist utopia and the ideology of Human Rights which assumes the destruction of cultural identities and the rejection of transcendence. Their dream is of a sterilized Islam rendered harmless. It’s this [American] hegemony which is in large part hostile to the national idea in general and nations in particular. Among themselves nationalists share a body of values common to civilizations whether Christian or even Moslem. These values go from patriotism to respect for the past, from attachment to the soil to love of family, and to all values that flow from them: fellowship, charity, honour, devotion, sacrifice, etc. In Italy in 2003 the media reported that Hassan Bendoudouh, professor of Islam and an official of the ‘post-Fascist’ National Alliance led by Giofranco Fini, stated: ‘I am a partisan of Fini and Allah. Islam is a religion of the Right, in that it honors family values and respect for parents and the ancestors’. Likewise France’s Front National has included Islamic officials, such as Le Pen’s adviser on Islamic affairs, Sid-Ahmed Yahiaoui, and electoral candidates who see no complication in being French and Muslim. Now, ideas must be put back in their historical context. The source of the ‘clash of civilizations’ theory goes back to 1990. The Soviet Bloc’s collapse took away the U.S.’s role of defender of the free world; there was danger for the U.S. in the multipolar world which they saw replacing the bipolar one. Therefore a replacement adversary was needed so that America could continue in its role as world policeman. The office of U.S. Secretary of State switched therefore from its ‘red’ theme, namely, Moscow is orchestrating a worldwide terror network consisting of Third-World revolutionary Marxist groups, to its ‘green’ theme, namely, there is a worldwide terror network consisting of revolutionary Islamist groups. At the same time, the U.S. Secretary of State adopted the Lake doctrine of ‘rogue nations,’ the majority of which, as if by some strange coincidence, are Moslem. 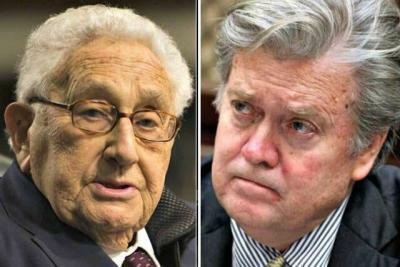 … As for these intellectuals who have theorized about the ‘clash of civilizations,’ you know them both: it’s Bernard Lewis and Samuel Huntington. Both insist on the importance of the Zionist Entity to the West’s resistance. And that introduces a second level of understanding of the anti-Islamist phenomenon, i.e. supporters of the Zionist Entity have grafted their struggle onto that of the American party. By developing a gigantic amalgam of Islam/Islamism/violence-in-North-African-neighorhoods/obscurantism/attacks-on-women, etc., they try to make ordinary Frenchmen believe that in Paris as in Tel Aviv the troublemaker, the killer, the terrorist, the one favouring a return to the Middle Ages is the same: the Arab and the Moslem. Hence, factions of the Right, having moulded a career out of following the U.S. pied piper of anti-Sovietism, supposedly in defence of Western Civilisation, have exchanged this mantle for that of anti-Islamism. Bouchet explains: ‘They were militant anti-communists when the U.S.A. had to justify its occupation of our continent by citing the “danger of the Red Army,” now they’re militant anti-Islamists when the U.S.A. has to justify its worldwide ambitions’. Stephen Goodson, A History of Central Banking, and Inside the South African Reserve Bank (London: Black House Publications, 2014). ‘U.N. ratifies migration pact’, ibid. See: K. R. Bolton, The Parihaka Cult (London: Black House Publishing, 2012). Leon Trotsky, ‘Perspectives and Tasks in the East’, speech on the third anniversary of the Communist University for Toilers of the East, 21 April 1924. E-mail to the writer, 24 March 2019. E-mail to the writer, 20 March 2019. ‘Christchurch Mosque shootings’, op. cit. Michael Neilson, ‘Christchurch vigil or political rally?, op. cit. Indeed, the attack that did take place at this time was on a young man wearing an NF t-shirt, who was beaten by two Somalis. In keeping with the mentality of the police, it was the victim who was tried, twice, unsuccessfully. His being beaten by Somalis became a cause celebre of the Left, an act of revolutionary courage. See: T. E. Lawrence, Seven Pillars of Wisdom (London: Black House Publishing, 2013). Introduction by Bolton. Asra O. Nomani and Hala Arafa, ibid. David Clarkson, ‘Kiwi teenager radicalised’, ibid. Sassy Telaa, ‘A Black Muslimah’s perspective’, ibid. Myrihla, ‘Where are the dark-skinned models?’, ibid. Abdullah Drury, ‘Home country doctrine’, ibid. See: Alex Miles, U. S. Foreign Policy and the Rogue State Doctrine (New York: Routledge, 2013), p. 142. Anthony Lake was President Clinton’s National Security Adviser. The forces at play here are (in my opinion) very much outside the realm of your average workaday New Zealand. The Hollywood script of the lone-white-male “gun nut” always invokes that instinctive wave of anti-gun hysteria – the role which our prime minister has played flawlessly. Then there are those memories of similar gun rampages in the US and elsewhere – although rather ironically I did not hear one reference being made to Dr Baruch Goldstein’s Islamophobic antics in Hebron (back in 1994) when he shot dead 29 Muslims and injured a further 125 (it however seems Palestinians are much more battle-hardened when it comes to staving-off the colonial oppressor as the survivors of that particular massacre beat the perpetrator to death). One can safely assume Goldstein would not fit the media profile of the white supremacist – simply because he was a Jew – hence the silence. We do not have to look very far to find any amount of inconsistency and hypocrisy.